A double dose of celebrations on my blog today. Firstly, I just passed 100,000 hits. Woohoo! Thankyou very much to all those who have visited and kept on visiting. Hopefully you have all been entertained and enjoyed what you saw along the way. Your comments have always been encouraging and I appreciate all your feedback. Secondly, it was a year ago TODAY that this whole blog began!! A BIG thankyou to Heri who after discovering I didn't have a website, suggested that I start up a blog to showcase my work. Before that I'd been itching to get a website together, but the knowledge needed and the cost of running it had put me off. This blog costs me nothing to run and is so much easier to keep updated than a regular site. I've managed to transform it into everything I wanted out of a website and then some, with the added bonus of being able to directly communicate with visitors. It's been a blast! On another celebratory note, my Chewbacca piece has been shortlisted for the next Exposé book from Ballistic Publishing. Crossed fingers and I'll keep you guys posted. UPDATE 18th April- Unfortunately Chewbacca didn't make the final cut for Exposé 5. Ah well...I guess for someone who doesn't specialise in 3D art I did pretty good to get that far. But enough chitchat, here's some artwork. I finally got around to inking and colouring my Joker pic from a while back. The scalpel was a last minute addition to balance out the pic. Chiris,good luck with the Chewbacca and all u do it's awesome, keep the good work alive!!! congrats chris! good luck with exposé! i love the joker in anything, this is fantastic! Thank you for having a informative blog Chris! Congratulations Chris, you are the man!!! Thank you. 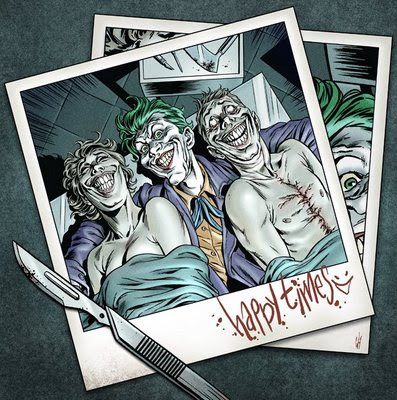 Love that Joker Pic. For me it's the contrast between the happy smiles and the gruesome act that makes it such a great idea mate. And congratulations on the blog. oh..i may have screwed up.. i posted a comment last night here but i can't find it..anyway..
i just wanted to thank you for this wonderful blog.. it's really a great motivation , inspiration and education too..
i rememeber that joker pencils a while ago.. you did a great job with the inks and colours here! hatem- Thanks for your kind words. Hey Chris. I jugested you to get a blog because It would be a crime for you not to share your work with the world. When I first saw your caricatures that you were posting at the board, I had to see more! I keep learning. Congrats all around to you for Exposé, for the 100k visits and for the blogaversary. Heri- Thanks again, mate. I'll send those drawings to you very soon. Thanks for the encouragement, Tonia. ...and what a year it was!